The word value is often used to describe something rather vague and nebulous, a grandiose idea or ideal, a corporate ethic or philosophy. But when we use the word, we mean something very different-something very real, very concrete and very powerful. Values possess power, a phenomenal power-the power to energize a company for rapid growth in revenues and profits-and this is a power, which is fully available and accessible to every company. Like opportunities in the external environment, the only essential conditions are: you must be aware of their enormous potentials and you must really want to tap them. Companies direct their energies by focusing on the achievement of corporate goals. The goal may be to achieve a quantitative target for units produced and sold or dollars of revenue and profit. The goal may also be to improve the quality of performance-to do work better, faster, more efficiently, more safely, more systematically, with improved communication or coordination, in a manner more pleasing to customers or more satisfying to employees, etc. These qualitative goals are what we mean by corporate values. Robert Cavalco discovered the power of values after he took over as CEO of Bang & Olufsen of America. BOA is the U.S. subsidiary of a $360 million Danish electronics manufacturer, known throughout the world for its technically sophisticated and superbly designed audio and video home entertainment systems. Bang & Olufsen is the Mercedes and BMW of hi-fi. When Cavalco joined BOA, he found the company facing fierce competition from Japanese electronics manufacturers. As a result sales had remained flat at for the past three years. Cavalco started looking for some chemistry to turn a difficult situation into an opportunity for growth and he found one, not outside in the marketplace, but within the company itself. The opportunity he hit upon was a value-customer service. He decided that it was not enough that his company offered the most elegant products on the market or offered acoustical quality equal to the world's best. BOA would offer the most elegant and best quality service to its customers as well. Having identified an opportunity, he took the idea to his four senior executives and shared his thoughts and enthusiasm with them. Customer service was something that they could share and get excited about. Then he carried it to his employees at BOA's Chicago headquarters and spoke with missionary zeal about the company's new direction. He talked with the company's sales representatives and customer service representatives, but he did not stop there. He got virtually everyone in the company involved, even the shipping and warehouse crews, the accounts receivable and credit personnel. He brought in a consultant to work with groups of employees to define what customer service should mean to the company and elicit their ideas on how to improve it. The idea seemed to appeal to everyone and it caught on. Cavalco and his management team spent the next few months traveling hectically around the U.S. meeting their customers and asking them, "What can we do to help and serve you better?" He and his team listened carefully and responded immediately wherever possible. They took action to liberalize the company's merchandise return policy, offer more flexible credit terms where appropriate, increase the speed of order processing, and improve the quality of packing. They sent out a traveling sales training program and trained 1,500 dealer sales people. Cavalco took many other steps to improve communication with his dealers. He even sent his chief financial officer to give free consulting services to electronics retailers who needed advice on how to manage their own companies better. The immediate result of these initial efforts were visible to everyone who knew and dealt with the company. Though few tangible changes had yet been made in the company's policies or practices, these efforts generated tremendous energy and excitement. Employees became more active and enthusiastic. Customers began to look on the company differently, as a friend and a partner. By the end of the year, Bang & Olufsen was rated the best customer service company by specialty home entertainment retailers. And after three years of no growth, the company's sales grew by 35%. That is the power of a value. There are seven important reasons why values have power. Values release energy because they motivate people. "People get far more excited about doing something as well as it can be done than about doing something adequately," says Steve Jobs. They motivate people to work together collectively to improve overall corporate performance. Everyone likes to be part of a company that is known for its quality or its service, its integrity or its fairness, its friendliness or its contribution to the community. People feel pride and satisfaction in being with an organization that has quality and class. People at London Life Insurance had gradually lost that sense of pride and satisfaction over the years as the quality of performance slowly deteriorated, so slowly that they still perceived the company as high quality long after that quality had begun to fade. After Ben Thompson-McCausland arrived, people became conscious of what the company had been in the past and could be again in the future. They took up the challenge to re-establish the company's great traditions. Once divided departments and groups started working together as a team to establish and achieve higher standards for speed, quality of work, customer satisfaction and communication. "We took a deliberate decision to commit ourselves to the values," Thompson-McCausland says. The focus on values released tremendous energy. Values also motivate people to improve individual performance on their own jobs. Profit and revenue growth may be powerful motivating goals for the owners of a company, the CEO and senior management. But what does accountant, the receptionist or the warehouse clerk have to do with profit? Even if the company has a profit sharing plan, many employees cannot easily see a direct relationship between their activities and corporate profits. But everyone can relate to values, because values apply to every job, every activity, and every operation in a company. Achieving a high level of performance on any value is self-gratifying, self-rewarding, even when it is not linked to compensation. At London Life everyone got involved and felt the personal impact of the focus on values, even the file clerks and secretaries. Employees worked together in groups to identify which values needed to be strengthened and the best way to do it. This gave each individual a sense of participation and ownership in the values. Once a consensus had been established, each person had a responsibility for increasing the quality of performance on his or her own job. The values became a personal challenge to every employee to improve execution of work. Every sales manager knows the power of setting targets for a sales force. The mere fact of establishing a quantifiable objective propels people to achieve it, on condition that they perceive it as a realistic target. But as Jan Carlzon found out, quantifiable objectives motivate only until you reach them. Once you achieve or exceed them, as SAS achieved and exceeded its three-year profit target the very first year, they no longer possess the power to raise performance further. That is why SAS leveled off after its initial explosive surge. Values, on the other hand, are not subject to this limitation, for they can never be fully and finally achieved. The achievement of better quality and improved teamwork today is no assurance that they will still be better tomorrow, any more than cleaning a room today ensures that it will remain clean tomorrow. Values are like ever-receding or never-ending goals. The higher the values, the more the energy and effort required to achieve and sustain them. The more you pursue them, the greater the energy they release and put into action. Goals are measures by which we evaluate our performance and strive to improve it. The effectivity of any measure is directly related to the quality of the measuring instrument. The finer and more perfect the result we seek to achieve, the more precise must be the instrument we use to evaluate our performance. We can use a yard stick to measure the length of a room or a bolt of cloth without much difficulty, but the same instrument is unsuitable for measuring the precision of a small ball-bearing or the dimensional accuracy of a hair-thin filament. For that we need a micrometer. High corporate performance requires perfect precision in decision-making, product quality, timeliness of action, personal behavior, clarity of communication, and in countless other respects. Although revenues, profits, production volume and other quantitative goals are good measures for overall corporate performance, they are too broad and crude to serve as effective and motivating measures of individual and group performance on many jobs and activities. But the quality of performance on every job, every activity, and every act can be accurately assessed in terms of values. American Express is a company dedicated to the value of customer service. The company has discovered how effective values can be for measuring and improving performance. It has set clear standards for what type of service it wants to deliver: replace lost or stolen charge cards within 24 hours, process new card applications within 15 days, ensure bills are completely error free, etc. It has a very sophisticated system for measuring the quality of service by monitoring performance on over 100 different activities. Every month the top management of the company reviews performance on these activities and takes action where necessary to bring it up to standard. The company has also instituted over 100 recognition and reward programs in place to motivate its people to deliver the very best service possible to American Express customers. Cash awards of up to $1000 are given for outstanding individual service. These and other programs help explain the conclusion of one expert on the credit card industry: "There's no getting around the fact that American Express's service is far and away the best in the industry." Take a close look at any company with a sustained record of high profits over a considerable period of time. Almost invariably you find that it is one that produces high quality products, delivers excellent service to its customers, insists on cleanliness and orderliness of its facilities, avoids waste of money and materials, functions systematically with good coordination and teamwork, shows respect for its people and provides continuous opportunities for them to grow, and so on. In surveys of over 1,000 American and European companies, we found that companies which rated their implementation of key corporate values the highest also reported the highest levels of revenue growth and profitability in their respective industries. Robert van Harten, a Dutch researcher, suggests there is a relationship between implementation of high corporate values and the long-term share value of public companies. It is common knowledge that share value does not always directly reflect short term financial performance. Non-financial factors such as the perceived quality of management undoubtedly influence investors. The quality of management is a nebulous entity, which has not been adequately defined up until now. The implementation of values is a very direct and appropriate measure of the quality of management. Studies of performance on specific values indicate a direct link between financial performance and implementation of values. The value quality has become the buzzword and cure all of the eighties, and rightfully so. Quality is powerful stuff. An analysis of 2,600 companies over 15 years by the Strategic Planning Institute of Cambridge, Massachusetts revealed, "financial performance is tied directly to the perceived quality of a company's goods and services. "Companies that offer the highest quality of products and services achieved the best long term financial results in terms of market share, return on investment and asset turnover." Punctuality or speed is another crucial value for high performance, one whose importance is greater than ever before. Fortune recently ran a feature article entitled "How Managers Can Succeed through Speed." The article cites a study by McKinsey & Co of manufacturers of hi-tech products, which shows a direct linkage between punctuality and profits. Companies that are able to bring out new products according to schedule earn 33% more profits on them over five years than companies, which come to market six months late. As Cavalco found out at Bang & Olufsen, improving corporate performance on a single value can virtually transform the way a company functions. Take punctuality or speed of response for example. Punctuality applies to virtually everything a company does-from the speed with which it answers the phone, replies to letters, processes orders, pays and collects money to the speed with which it adopts new technologies, develops new products, introduces new systems, responds to new market opportunities, recruits and trains people, plans and evaluates work, etc. Actually it is not possible to raise performance on any one value very high without improving performance on other values as well. Punctuality is improved through more systematic functioning, better coordination and teamwork, enhanced communication, etc. When C & J Industries decided to improve deliver time on their molds, they had to raise performance on a host of other values. First they increased communication and coordination between sales, engineering and production in order to improve production scheduling. Then they analyzed the entire range of molds they were making and found that 85% of them could be built with standard off-the-shelf bases. So they decided to standardized their entire product line and only offer those sizes. They also standardized the process of developing bids for customers' jobs and found they could reduce bidding time by 90%. The company also improved coordination with its supplier of mold bases to ensure that they could always get immediate delivery on the mold bases they required. Defective quality resulted in the need for frequent reworking of molds, which also delayed deliveries. The company made a major commitment to eliminate the need for reworking by improving quality. They introduced a comprehensive quality-training program based on Deming's 14 points to upgrade the skills of their people. Therefore, in trying to improve punctuality, they actually enhanced the values of coordination, standardization, quality and development of people as well. The focus on values enabled C & J to cut their delivery times by 50%. Each component of a business consists of many types of activities. By raising the quality of performance on these activities, we release the potentials of the component and turn it into an engine of growth. Each value can be applied to all of the five components. Quality, accuracy, orderliness, and punctuality are as important in finance as they are in production. Innovation applies to designing systems, developing advertisements and raising capital as much as it does to improving technology. Therefore, raising performance on even one value across the boards can have a tremendous impact on all five components of the company. Every value is a window of opportunity for raising overall corporate functioning, just as much as a new market or a new product. When Waltz Brothers was on the verge of bankruptcy, the owners focused on values to turn their business around. One of the keys to their success was the value systematic functioning. When the four cousins took a close look at their business, they realized that they were spending so much of their time on routine operational tasks that they really had no time left to manage the development of their business. They also saw that many important tasks were not being done very regularly or reliably. They decided that one way to dramatically improve the performance of their company would be to run the company much more systematically. So they reviewed all five components of their business and improved the systems for budgeting and cost control (finance); manpower planning, recruitment and training (people); inventory control and scheduling (organization); quality and maintenance (technology); and sales planning and customer service (market). Values are the most powerful way to release and harness the company's latent, unutilized energies for growth. The process of energy conversion, which we described in Chapter Four, takes place in every company. But in most companies, it occurs primarily at the level of physical energy and physical work-which is the lowest and least powerful level of functioning. Values upgrade the quantity and quality of energy available by harnessing organizational energies-the power of authority, freedom, systems, coordination and communication-and psychological energies-our interest, excitement, enthusiasm, pride, emotions, innovation and inspiration. Values elevate our work from the level of mere physical activity to the level of organized efficiency, emotional involvement and mental creativity. Values also focus and multiply these energies more effectively. They refine the lenses and generate more efficient transmission and utilization of the available energies. The list on the next page includes some of the most important corporate values, but it is not exhaustive. These values are divided into three categories, according to the primary type of energy, which the value generates when it is implemented. Implementing values in the first list releases greater physical energy. Work becomes brisk and precise. It proceeds on schedule without interruption. Implementing values in the second list upgrades the functioning of the organization. People, departments and activities function more smoothly and interact more harmoniously. The organization becomes alive and dynamic, responsive and adaptable. There is a sense of competence and momentum. The psychological values release the emotional and mental energies of people in the company, customers, vendors and even the general public. These values make work exciting and rewarding. They generate pride and dedication. They motivate employees to go the extra mile to serve and please the customer. They can also invoke an intensely positive attraction or loyalty from customers-like the intense loyalty of many Macintosh users to Apple Computers. Our interest in values is far from academic. Values have everything to do with energy, the five engines and the energy conversion process. Therefore they have everything to do with growth, especially rapid growth, and with doubling or tripling your company. In earlier chapters we asked you to analyze the five components of your business and the energy flow in your company in order to help you answer the question "Where are we?" Values represent a third and final piece of the picture. In order to evolve the most effective strategies to accelerate the growth of your company, you need to know where it is with respect to values as well. In the next chapter we will examine specific strategies to raise the level of value implementation. But first, think about the values in your company. 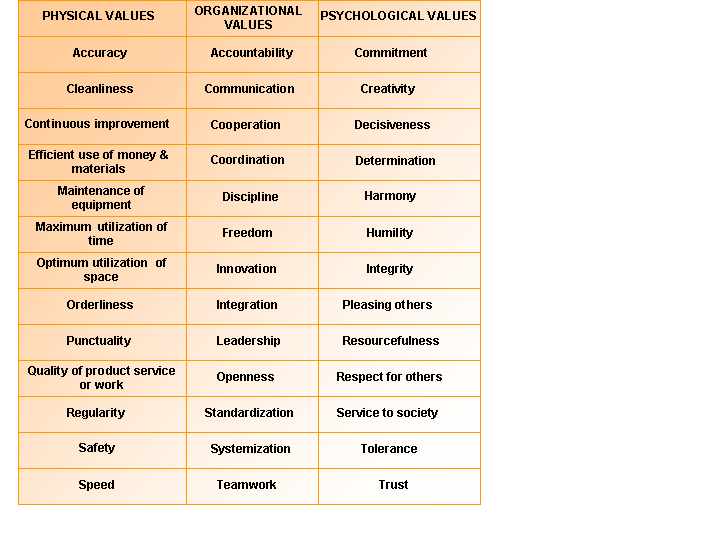 How many of the values listed above are really important to your company? Which are the strongest? Which are the weakest? Which values have helped propel the growth of your company? Which ones have a direct impact on sales? on profitability? on motivation? How successful are you in actually implementing these values on a day-to-day basis and maintaining a high level of performance on them? The greatest potentials for the growth of any company are generated by a commitment to high corporate values. By values, we mean the qualitative goals, which the company strives to achieve in all its activities. Values release and direct energy, motivate people, generate profits and promote non-stop expansion. Values are the key to energizing the five components. Values raise the quality of corporate energies and elevate work to a higher level. There are three types of values-physical, organization and psychological-which differ in the level and intensity of the energy they release.